The intellectual and human story of a mathematical proof that transformed our ideas about mathematics. In 1824 a young Norwegian named Niels Henrik Abel proved conclusively that algebraic equations of the fifth order are not solvable in radicals. In this book Peter Pesic shows what an important event this was in the history of thought. He also presents it as a remarkable human story. Abel was twenty-one when he self-published his proof, and he died five years later, poor and depressed, just before the proof started to receive wide acclaim. Abel's attempts to reach out to the mathematical elite of the day had been spurned, and he was unable to find a position that would allow him to work in peace and marry his fiance. 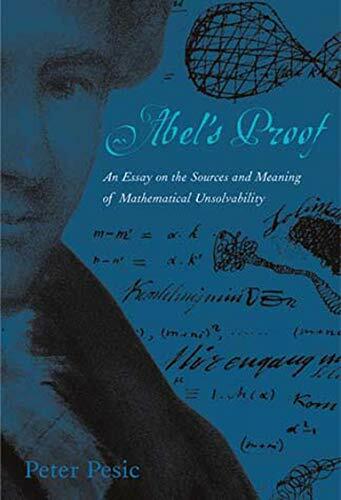 But Pesic's story begins long before Abel and continues to the present day, for Abel's proof changed how we think about mathematics and its relation to the "real" world. Starting with the Greeks, who invented the idea of mathematical proof, Pesic shows how mathematics found its sources in the real world (the shapes of things, the accounting needs of merchants) and then reached beyond those sources toward something more universal. The Pythagoreans' attempts to deal with irrational numbers foreshadowed the slow emergence of abstract mathematics. Pesic focuses on the contested development of algebra-which even Newton resisted-and the gradual acceptance of the usefulness and perhaps even beauty of abstractions that seem to invoke realities with dimensions outside human experience. Pesic tells this story as a history of ideas, with mathematical details incorporated in boxes. The book also includes a new annotated translation of Abel's original proof.